The iPhone percentage isn’t a misprint. Apple still bundles a woefully inadequate 5W charger with the iPhone XR (as well as the thousand-dollar iPhone XS models), and it charges the iPhone incredibly slowly. To get faster charging on the iPhone XR, you’ll need to pony up $19 for Apple’s 12W USB Power Adapter or buy a similar third-party plug. In any case, it’s not as good as the OnePlus’s fast charging. Results pulled a bit more even with wireless charging, though the iPhone brought up the rear here too, topping off at 7.5W while the Note 9 reached 10W. The Pixel 3 XL also reached 10W, but it required its own Pixel Stand to do so and dropped to 5W on other chargers. 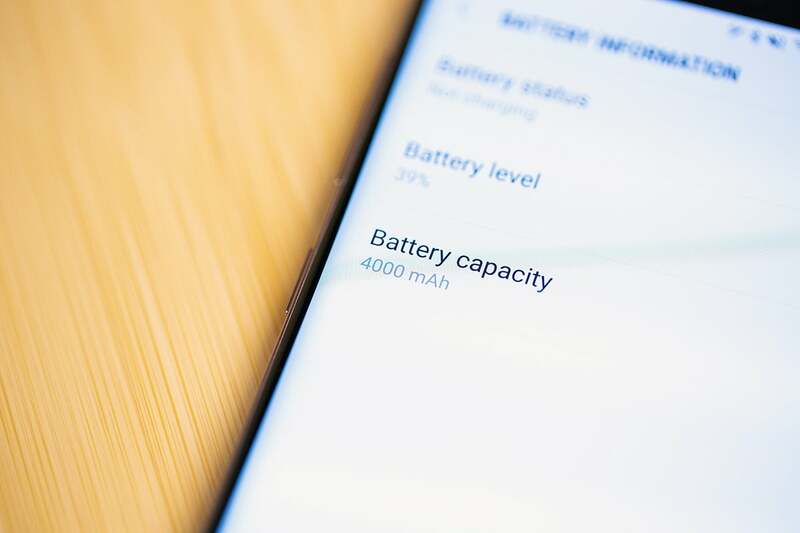 The OnePlus 6T doesn’t offer wireless charging yet, which is a bummer, but the strength of its cable system edges out its competitors. 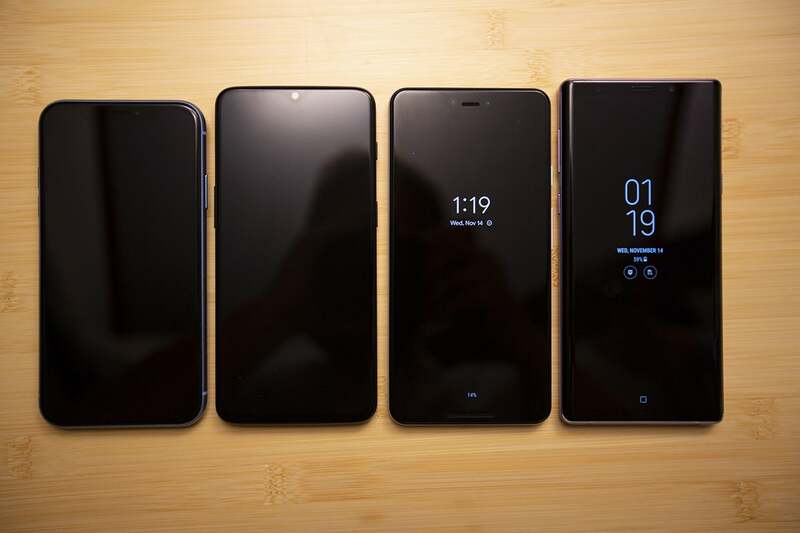 It might be hard to tell of any these phones apart with the screens off, but using them is a different story. 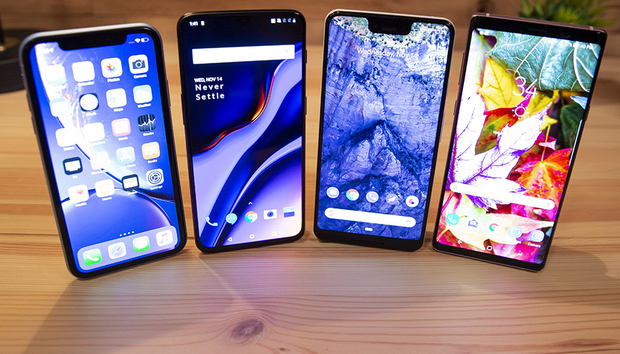 Android fans will point out that all of these phones have more RAM than the iPhone, but Apple manages to make good use of the iPhone XR’s memory, too. On average, it kept around 12-15 apps at the ready for switching (without needed more than a second to load), the same as the Note 9 and the OnePlus 6T, and way more than the Pixel (though Google says that’s a bug that will be addressed in a future update). 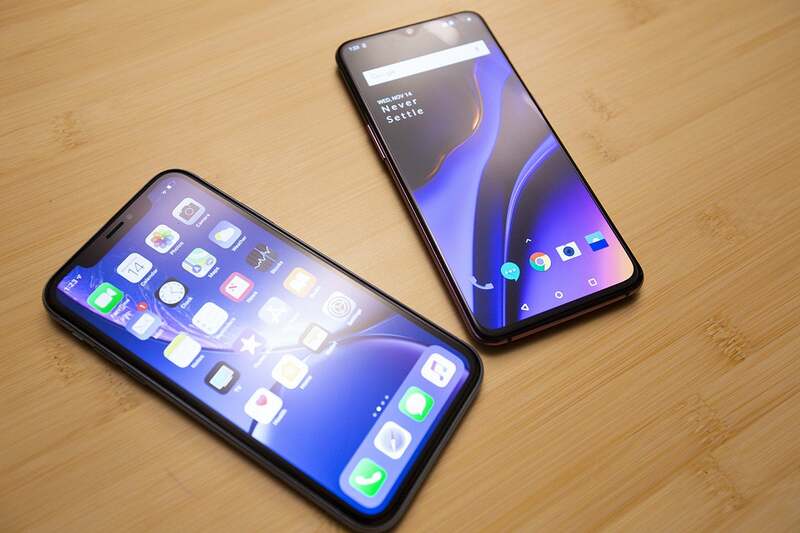 Rumor has it that the Snapdragon 855 will catch up, but for now, the gap is very wide. The Galaxy Note 9 is the only phone here that still has a headphone jack, so it starts off with a big lead out of the box. To compensate, Apple offers up a set of Lightning Earbuds but opted to dump the 3.5mm adapter this time around (you can buy one from AppleRemove non-product link for $9.) OnePlus includes a USB-C to 3.5mm adapter but you’ll need to buy a pair of $20 USB-C BulletsRemove non-product link. Google bests them all, bundling a set of surprisingly good USB-C Pixel Buds along with a USB-C to 3.5mm adapter in every Pixel 3 box. 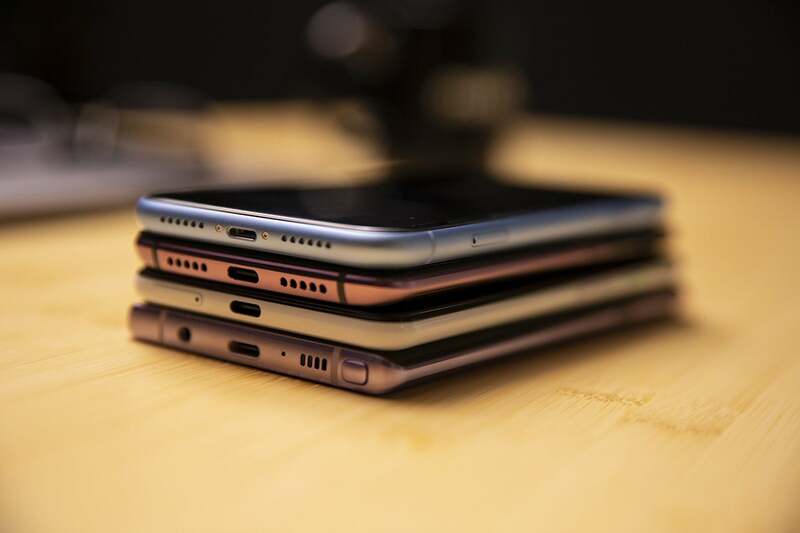 The Galaxy Note 9 (bottom) is the only phone here to offer a headphone jack. The iPhone XR, Pixel 3 XL, and Note 9 feature stereo speakers (the 6T does not), and they all sound great. When pumped to the max, the iPhone XR has excellent bass but can get a little muddled, and the Note 9 is a touch tinny for my ears. The Pixel 3 XL sounded best due to its front-firing speakers. Apple introduced Face ID with the iPhone X, and it only took a year to bring it to the rest of the iOS lineup, including the iPad Pro and iPhone XR. Apple has improved the system for its 2018 phones, and the enhancements only pad its lead. In short, Face ID makes all other biometric options seem slow, clunky, and just plain dated. 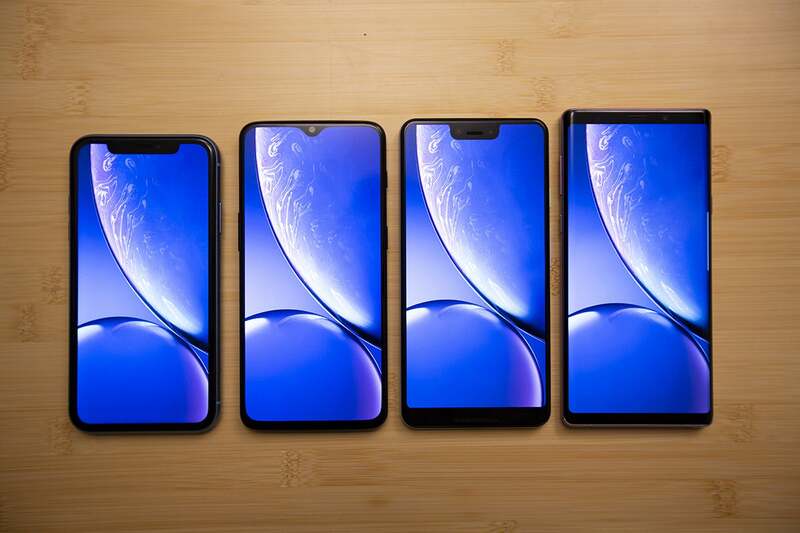 The iPhone XR (far left) is the fastest and simplest to unlock. None of the Android phones here have a system to match the combination of security and simplicity that Apple delivers with Face ID on the XR. OnePlus’s in-display fingerprint sensor brings a wow factor for sure, but it’s slower and less reliable than traditional fingerprint sensors. While the 2D facial recognition on the 6T works incredibly fast, it can be easily spoofed, which kind of defeats the purpose. 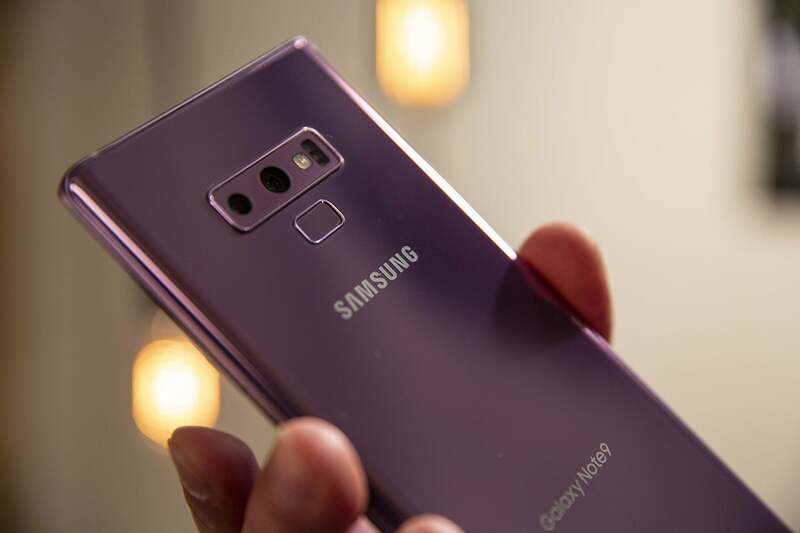 The Note 9’s iris scanner is the closest thing to Face ID, but it’s much too persnickety to really compete. The Pixel 3 XL doesn’t even try, offering only a standard fingerprint sensor on the rear. A smartphone is only as good as its software, and you pretty much know what you’re getting with the XR: the newest OS, years of updates, and strong app support. The new full-screen design means gesture navigation takes over, and it’s just as intuitive, familiar, and responsive as it was with the home button. 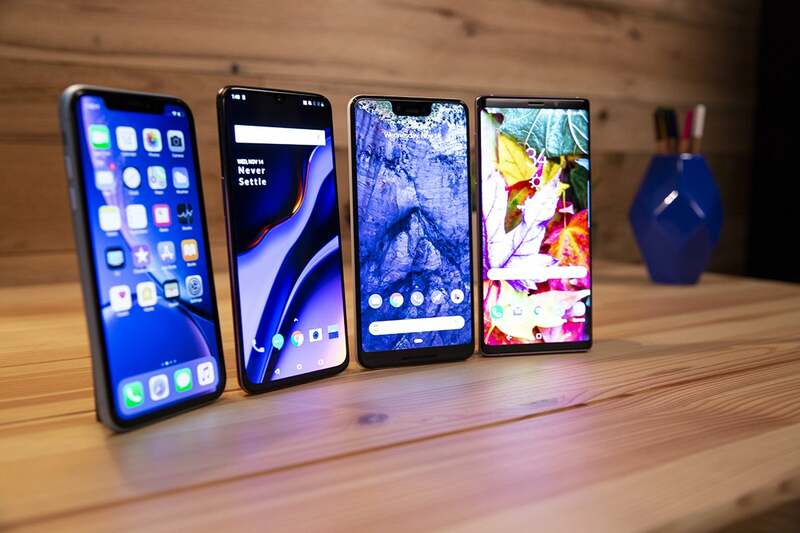 The XR is one of three out of the four handsets here to support both gesture navigation and the latest respective OS, with the Note 9 being the odd phone out. They’re all somewhat similar: Swipe up to go home, pause to multitask, swipe right to cycle through apps, etc. But while it’s clearly the future for the iPhone, it’s less certain on Android. The OnePlus 6T (second from left), Pixel 3 XL (second from right), and Galaxy Note 9 (far right) all run Android, but the experiences are very different. 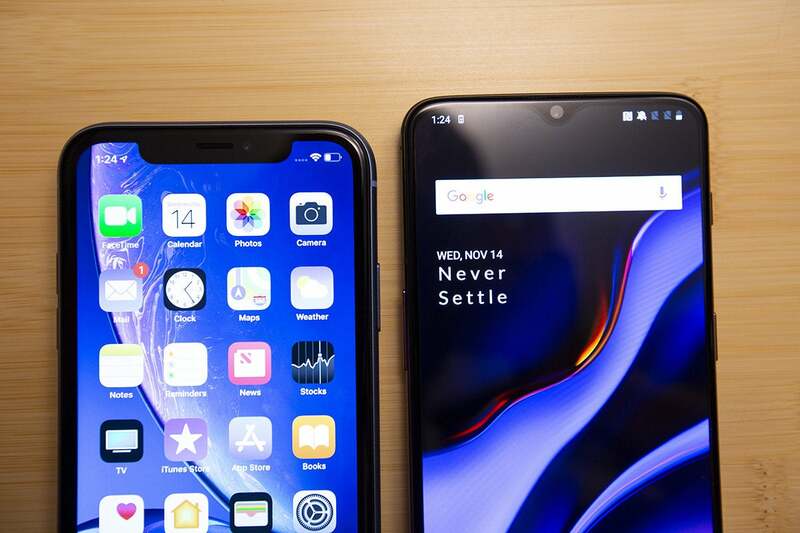 The OnePlus 6T is the only to offer the option to switch between gesture and virtual button navigation, and I suspect lots of users will opt to leave it off. Gesture navigation in Android 9 Pie is nowhere near as fluid nor smart as it is on the iPhone, and the enhancements OnePlus has added don’t move the needle. In fact, without the home button or indicator line as guidance, I was often confused as to where and how to swipe on the 6T. Even on the Pixel 3 XL, where gesture navigation is as good as it gets on Android, there’s a clunkiness and half-baked nature that makes it feel stickier and slower than it does in the XR. The Pixel’s tremendous speed and optimization more than make up for it, but switching between it and the XR only highlights the iPhone’s advantage. On the XR, gesture navigation is smart and smooth as butter. 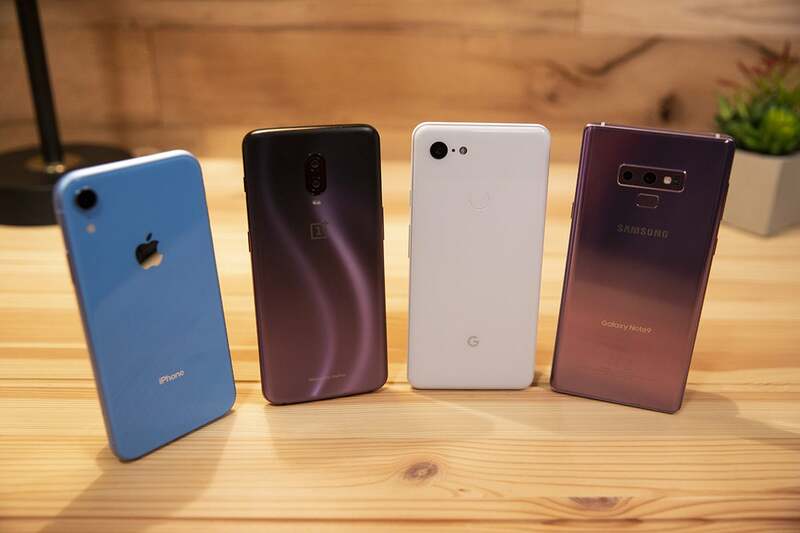 (Left to right): The iPhone XR, OnePlus 6T, and Pixel 3 XL all run the latest version of their respective operating systems, but the Galaxy Note 9 is still stuck on Android Oreo. But the Pixel 3 is head and shoulders above the rest of the Android field. The Note 9 is still on Oreo and will be for a while, and even the minimal OnePlus 6T feels just a touch slower that it does when compared to the Note 9. Android on the Pixel 3 is the closest you’re going to get to iOS on the iPhone, with tight end-to-end control over the entire system that results in a top-notch experience (no pun intended). Six seconds might not seem like a lot, but when you’re staring at the screen, it seems like an eternity. And it’s like that all over the Pixel 3: apps, multitasking, scrolling, it all flies by and makes the other Android phones feel inferior. Google also promises two years of major updates and three years of security updates, which is way more than you’ll get on any other Android phone. It’s still not as good as Apple—especially when it comes to fixing major bugs that pop up—but Pixel owners are consistently the first to get updates. Ultimately, choosing between the Android 9 and iOS 12 is a matter of preference, and there are strong opinions on either side. Let’s call this one a tie. Only the Galaxy Note 9 lets you pop in an SD card and double the storage to 1TB. Apple actually offers a decent upgrade for the XR, letting you go from 64GB to 128GB for just $50. Google charges $100 for the same storage bump. Samsung offers a good value, but forces users to upgrade to more storage than they probably need (though it does bump the RAM to 8GB). It’s also the only phone to offer an SD slot for expandable storage, so you could bump it up to a full terabyte, which is just nuts. 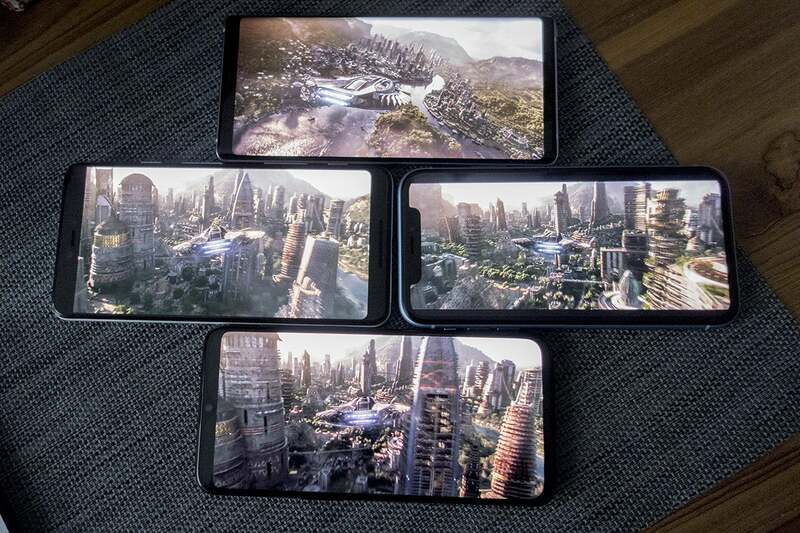 I still have to give the crown to the OnePlus 6T here. 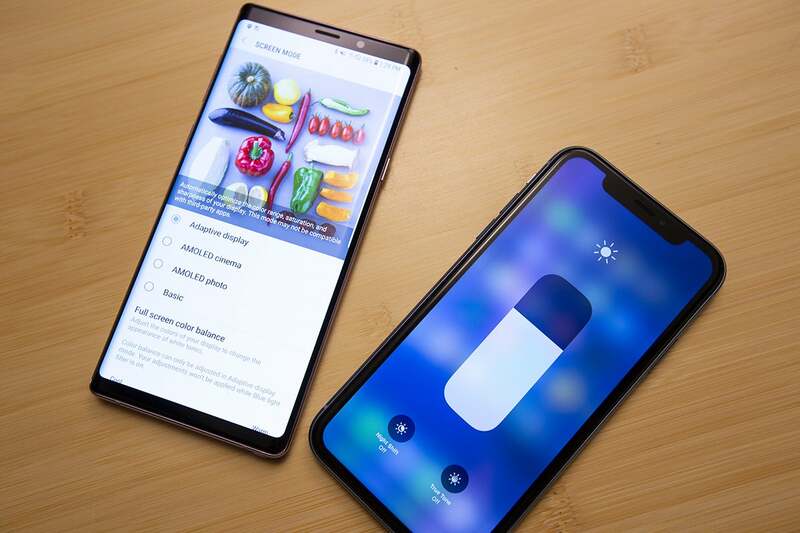 It offers the best per-gigabyte value—and also bumps the RAM to 8GB in the 256GB model—and it’s not overcharging or forcing heaps of storage on its users, like Samsung does with the Note. That’s why I like the 128GB option on the XR for $50, which Apple doesn’t offer on the iPhone XS. Everyone cares about their phone's camera. We look closely on the next page. 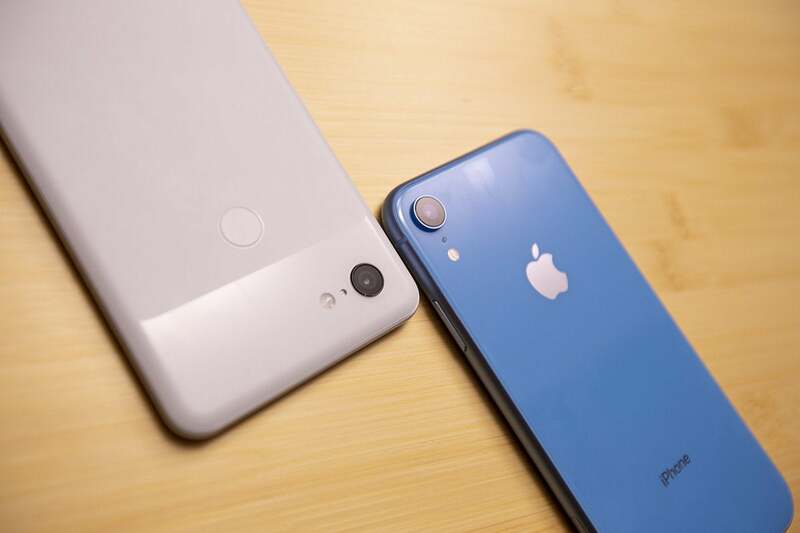 The Pixel 3 XL (left) and iPhone XR both have single cameras, but they perform as well as dual-camera phones. But like battery capacity, specs don’t mean much when it comes to smartphone cameras. More and more work is being done by the image signal processor, and it’s gotten to the point where the computational work is far more important than hardware. Quite frankly, OnePlus’s camera doesn’t even really compete against these phones. In Portrait Mode, the Pixel 3 XL (top right) once again blew everyone away with a stronger unadjusted bokeh effect and crisp definition. 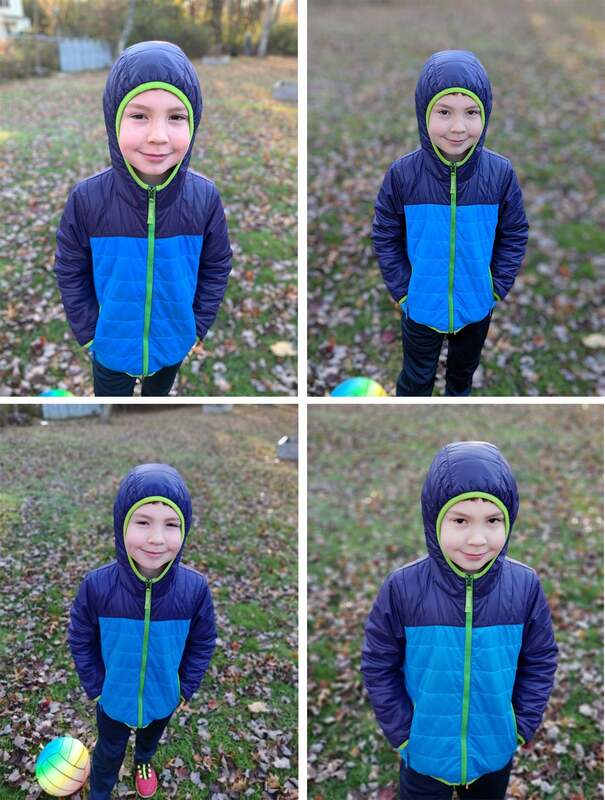 The iPhone XR (top left) nailed the color of my son’s cheeks, while the Galaxy Note 9 (bottom right) and OnePlus 6T (bottom left) smoothed his features a bit too much. The iPhone XR uses the same lens as the XS, so the only thing you’re losing from Apple’s thousand-dollar phone is 2X optical zoom and the depth necessary for true portrait mode. Apple does offer portrait mode on the XR (unlike prior single-camera iPhones), but only for people, a limitation that isn’t on any of the other phones. For pet lovers, that alone is probably a deal-breaker. 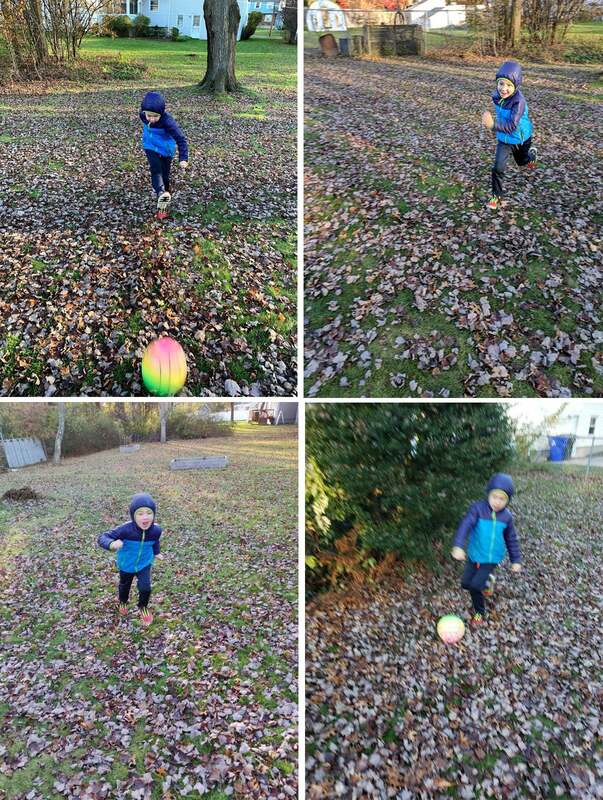 All four phones have optical image stabilization on the main camera, but the iPhone XR (top left) and Pixel 3 XL (top right) handled motion much better than the OnePlus 6T (bottom left) and Galaxy Note 9 (bottom right). With low-light images, the Pixel’s Night Mode blows the XR and everything else away. It’s astounding. The OnePlus 6T has a Night mode as well, but it doesn’t come close—adding a weird sepia glow to things and completely blowing out any available light. Dark scenes that are barely recognizable on other phones are gorgeous on the Pixel 3 XL, with even light and details that XR and Note 9 simply can’t see. Some might argue that the photos are unnatural and soft, but unless you’re inspecting them closely, they’ll look perfectly fine to most eyes. When they’re taking a picture of their kids in a dark room and the end result looks like it was professionally lit, parents aren’t going to care about a little facial smoothing. 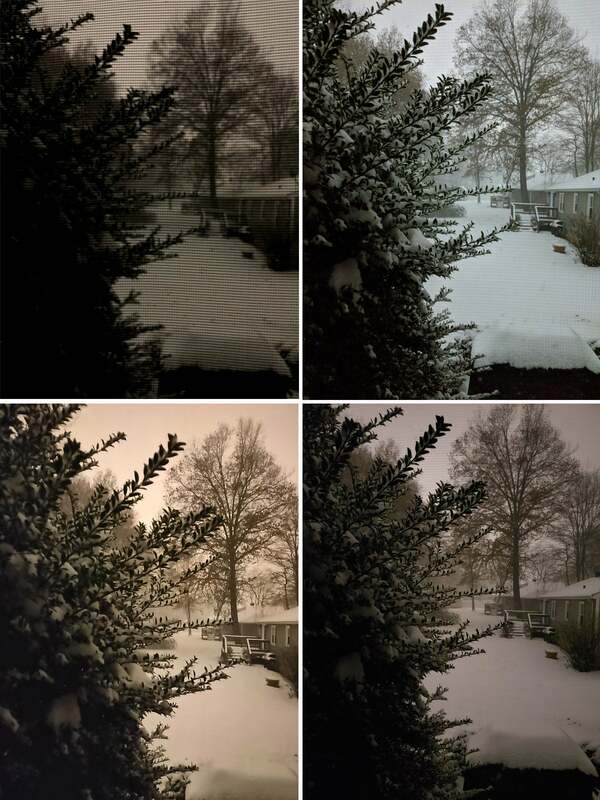 Night Sight on the Pixel 3 XL (top right) is just remarkable, showing up the OnePlus 6T’s own Night mode (bottom left). The Note 9 did OK with its f/1.5 camera (bottom right). The iPhone XR (top left) just plain struggled in this nighttime scene. The Pixel 3 XL doesn’t just take better pictures than the rest; it’s downright remarkable what it can do with a single lens (and a lot of background processing). The iPhone XR and Note 9 were often close (though the XR really struggled with low-light shots), but from portraits to low-light photos, the Pixel 3 XL truly raises the bar for smartphone cameras. Apple generally gets trounced when it comes to price, but the iPhone XR is different. It was created as a lower-priced alternative to the iPhone XS, and at $749, it offers a surprising value for what you get. That’s $150 cheaper than the Pixel 3 XL and $250 less than the Note 9. 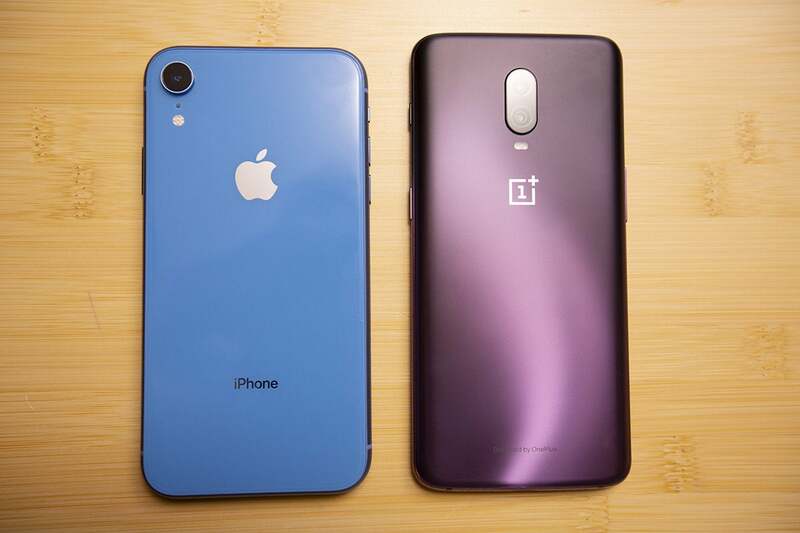 Even of you spring for the top-of-the-line model, the OnePlus 6T (right) offers a fantastic value over the iPhone XR. The OnePlus 6T costs even less, starting at $549. You’re giving up a few important features, namely wireless charging, water resistance, and stereo speakers, and the camera is unremarkable. But the specs are otherwise top-of-the-line, the screen is great, and the design is simply gorgeous. Even of you max it out with 8GB of RAM and 256GB of storage, it’ll still cost you $120 less than the iPhone XR. Apple might have pulled off a nice trick by trimming 25 percent off the price of the iPhone XS without sacrificing too much of what makes it such a great phone, but I just can’t overlook the tremendous value offered by the 6T. 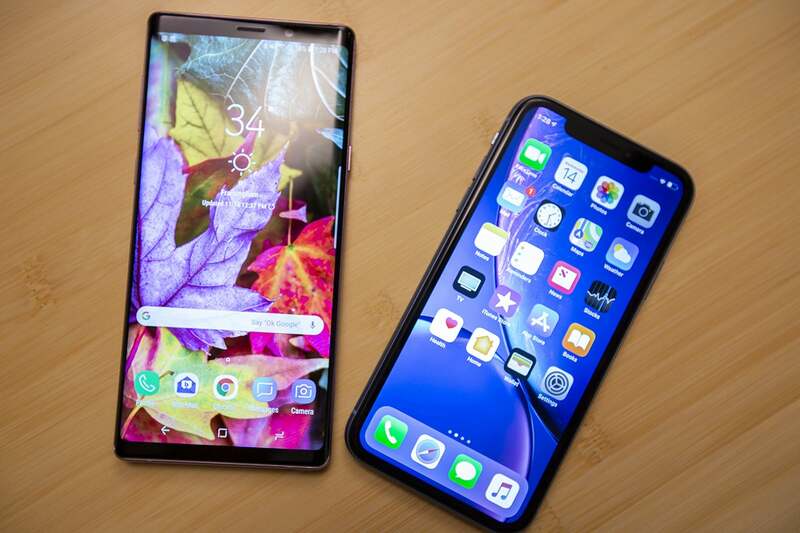 While last year’s battle produced a clear winner in the iPhone X, the competition is a lot closer this year. The iPhone XR lost a few main categories, namely design, display, and camera. Priorities matter, too. If you care about pixel density, the extra $250 for the Galaxy Note 9 will be well worth it. The same goes for the $899 Pixel 3 XL (or $799 Pixel 3, which I didn’t test but has the same camera) if you want to take the best possible photos. And if design’s your thing, definitely take a look at the Thunder Purple OnePlus 6T. 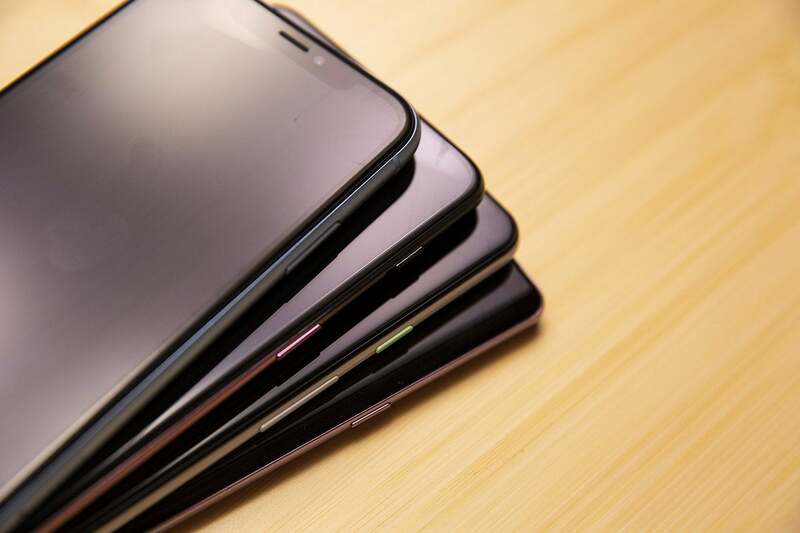 The best phones of the year also come in some of the best colors of the year. But if you want the best all-around phone that won’t cost a thousand bucks, that delivers incredible performance and battery life, next-gen biometrics, a strong OS, and an attractive price, the iPhone XR is the way to go. No Android phone has quite the same combination of specs, features, and power, even if the XR falls a little short in the areas where iPhones usually excel. When I looked at the results, the XR’s performance and update guarantee were enough to push it over the edge. But again, it’s very close. 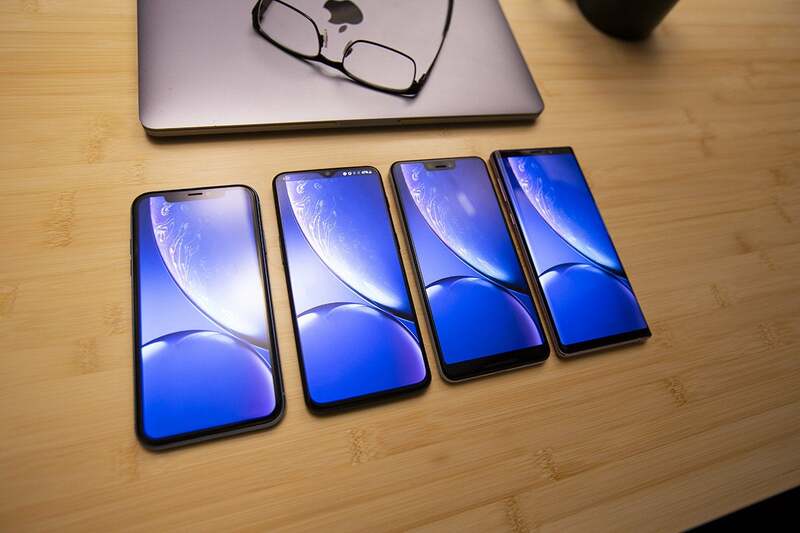 Apple just needs to work on those damn bezels for next year.